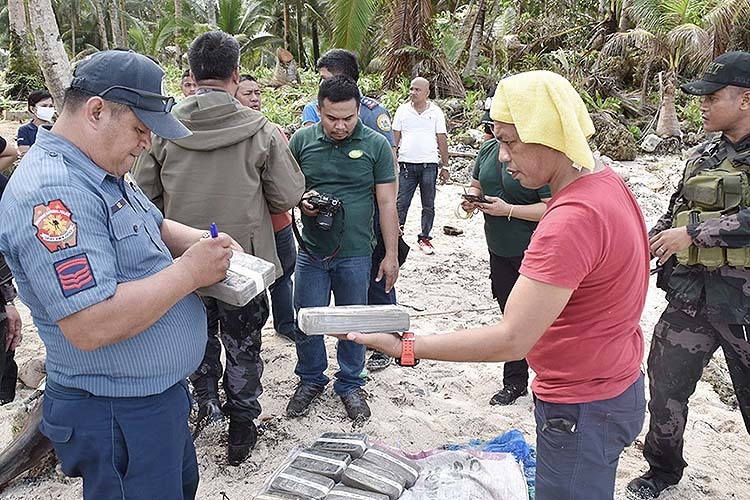 SURIGAO CITY [UPDATED] – A lawmaker here has called on law enforcement agencies to look into the 77 cocaine bricks that washed ashore on Dinagat Island and Siargao Island, in Surigao del Norte. Surigao del Norte second district Rep. Robert Ace Barbers said Saturday the Philippine Drug Enforcement Agency (PDEA) and the Philippine National Police (PNP) should look deeper into the recovered cocaine bricks that authorities said have a combined value of PHP462 million. Police and local officials said 37 blocks of cocaine were fished out off the Dinagat town of Cagdianao on Tuesday (Feb. 12) and another 40 blocks were recovered along the coast of San Isidro town, Siargao Island, two days later. PDEA-Caraga confirmed the bricks to be cocaine after subjecting the samples to laboratory tests on Friday. Barbers said the recovered illegal drugs and in other places of the country could be linked to “narco-politics,” noting that the election period is approaching. “It is an open secret in my province that some politicians are involved, directly or indirectly, in illegal drugs operations,” the lawmaker said, without elaborating. “It is not far-fetched to think that people involved in this have heightened their illegal activity and use their loot for the May 2019 elections,” he added. The lawmaker noted that last week, some PHP5.4 million worth of cocaine was also found floating along the shores of Vinzons, Camarines Norte. Chief Superintendent Gilbert Cruz, Police Regional Office-Caraga director, said foreign drug syndicates usually use or attach GPS (global positioning system) to their illegal cargoes, then dump these in Philippine shores to be retrieved later by local contacts.